The execution of the Agasse brothers caused a great sensation in revolutionary France. The Agasse were a respectable Parisian family and the two eldest brothers were the proprietors and publishers of the Moniteur newspaper. In 1790, they were accused of forgery of banknotes, found guilty and condemned to death by hanging. As it often happened at the time, the sentence was disproportionated to the crime and, because the people strongly sympathized with the brothers, it may have been natural to expect a pardon or at least a commutation of the sentence. 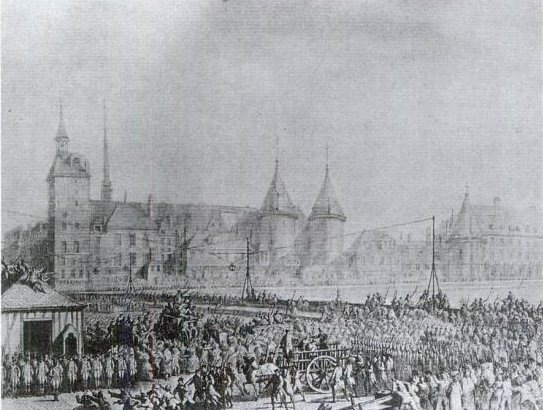 "Three days after the passing of the decree the battalion of National Guards of the district of St. Honore, where the Agasses resided, assembled in grand parade; they voted an address to M. Agasse, the uncle of the criminals, first, to condole with his affliction, and secondly, to announce their adoption of the whole surviving family as friends and brothers; and, as a first step, they elected the young brother and younger cousin of the culprits to be lieutenants of the Grenadier company of the battalion, and then, the battalion being drawn up in front of the Louvre, these young men were marched forth, and complimented on their new rank by M. de Lafayette, the Commander-in-Chief, accompanied by a numerous staff. Nor was this all: a deputation of the battalion were formally introduced into the National Assembly, and were harangued and complimented by the President on this touching occasion. They were afterwards entertained at a banquet, at which Lafayette — then in more than royal power and glory — placed them at his sides, and frequently embraced them. They were also led in procession to St. Eustache and other churches, and paraded with every kind of ostentation, to the public gaze. 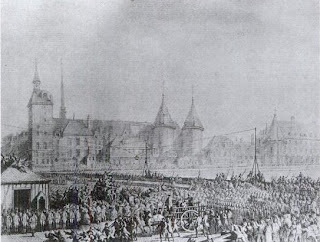 A public dinner of six hundred National Guards was got up in their honour; numerous patriotic and philanthropic toasts were drunk, and then, in an "ivresse", not altogether of wine, the newspapers say, but of patriotism and joy, the two youths were marched back through half Paris, preceded by a band of music, to the house of the uncle, where the rest of the Agasse family, old and young, male and female, came forth into the street to receive the congratulations of the tipsy crowd. Can we imagine any greater cruelty than the making a show of the grief of these unhappy people, and thus forcing them to celebrate, as it were, - in the incongruous novelties of gold lace and military promotion, and public exhibitions, - the violent death of their nearest and dearest relations?" This way, the revolutionaries congratulated themselves for having saved "a family from the menace of an unjust prejudice". According to the same book, the two brothers were also "led forth to execution in a kind of triumph", which only made the two men feel worse. They were hanged on 8th February 1790 and their bodies were returned intact to their family. 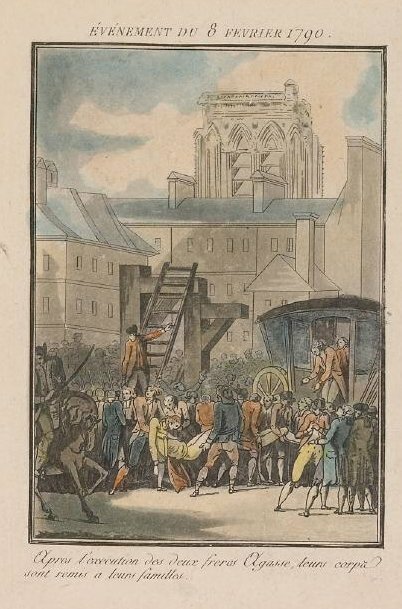 Their hanging was also celebrated in a series of contemporary prints, together with other key events of the Revolution such as the Tennis Court Oath and the march on Versailles. In the words of Crocker, "we hardly know a stronger instance of the characteristic perversity with which the Revolution, in all its transactions, contrived to transmute the abstract feelings of mercy and benevolence into practical absurdity, mischief, and cruelty."